Confession: I forgot my camera at home today, so you get a lame iPhone picture. I am still being ravaged by seasonal allergies, although today I had a stuffy/leaky nose rather than the raw throat/stomach thing of the last few days. I’m hoping that’s a good sign? I checked the allergen counts and they’re supposed to decrease this week, so that’s good, hopefully? 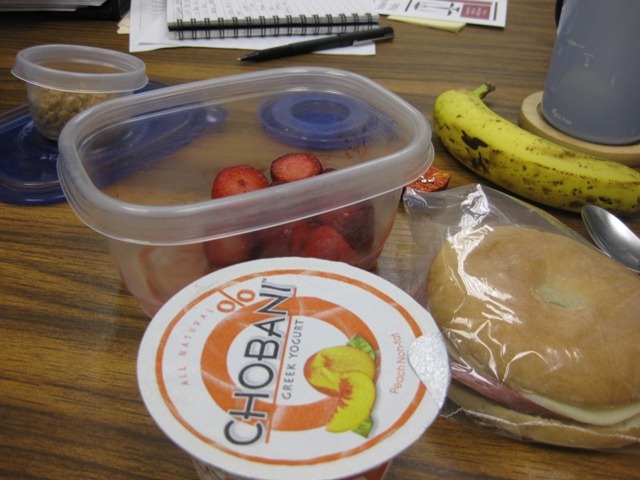 Lunch was boring. This cantaloupe is not as good as the one I ate last week. 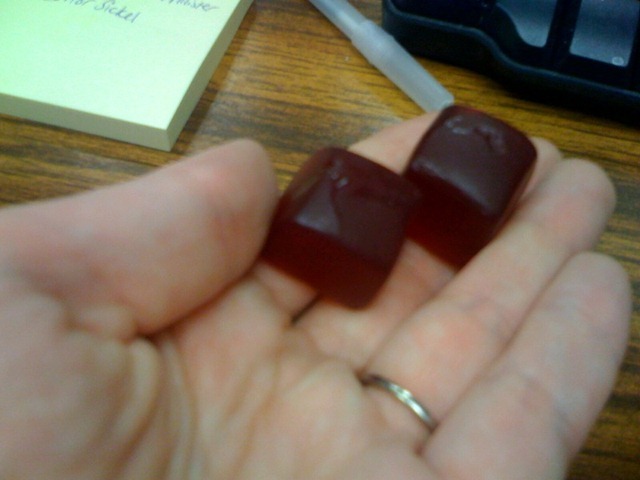 I had a few Shot Blocks before my run because my stomach was kind of growly. I really like these, but they stick to my teeth! I think they would bug me during a run. After work I went to the gym. I decided to play with speed a little bit and ran 3 miles in 28:00. Not a record or anything, but a good pace mostly pain free. I will admit my left knee and ankle are twinging a tiny bit. Apparently there was a hailstorm between the time I left the gym and got home. Tim put them in a cup so I could take a picture for the blog. See? Hail. April showers, indeed. It is still pouring here! We officially have over half the RSVPs back! All these nice little notes make me smile. And totally validate the hours I spent coated in tape goo with blisters from scissors! I’m starting to get nervous about my half now that I KNOW I can run. There are so many things that could go wrong—blisters, knee/foot/ankle/whatever issues, pukey-ness, falling on my face, asthma…I find myself just keep going over everything over and over again! I still haven’t decided if I’m going to run with my Shuffle or iPhone, when/how much Gu I’m going to take, and so on. It’s going to be a jittery few days around here. At least I have a solid outfit picked out and tested. That’s something, right? Do you get nervous about racing? What do you do to calm yourself down? 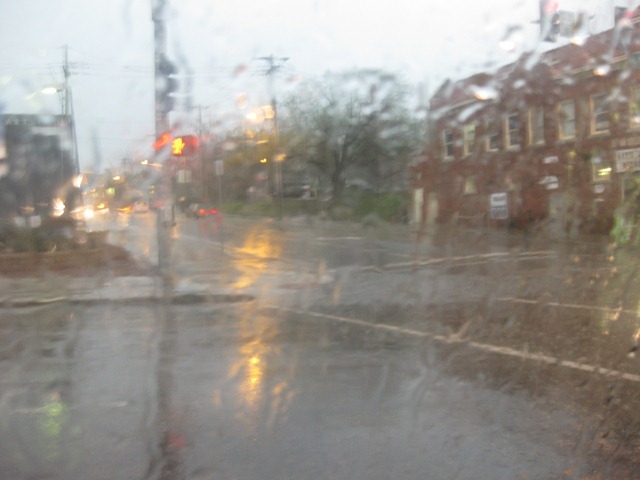 Of course, things cleared up as soon as I stopped driving. 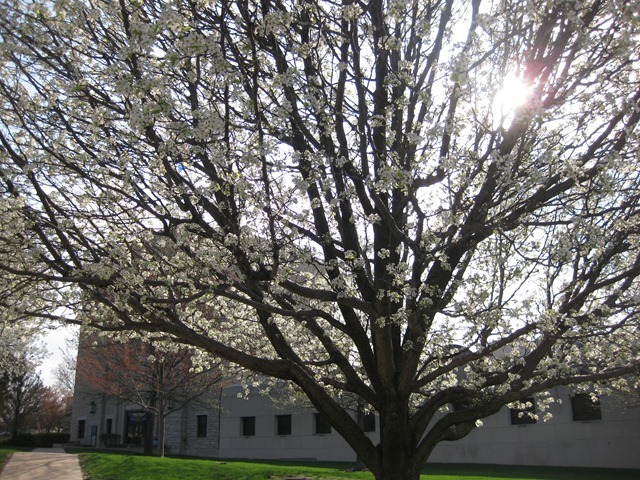 Spring has definitely sprung in these parts. The grass is green and the flowers and trees are beautiful. Unfortunately, they’re also making me MISERABLE. I seem to be extra-allergic to Kansas City. All fall I could barely breathe, and now my sinuses are in mucous overdrive. I felt better this morning than I did yesterday morning, but all day I was sniffling and sneezing and my eyes were watering. (And I do take Zyrtec once a day, too!) I also have a constant mildly queasy feeling from all the sinus muck building up in my stomach. Blerg. I hope this is gone by Saturday. Today’s run was kind of a big deal to me. 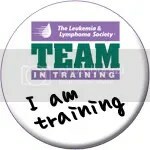 Mentally, I NEEDED a good run under my belt to feel prepared for Saturday. 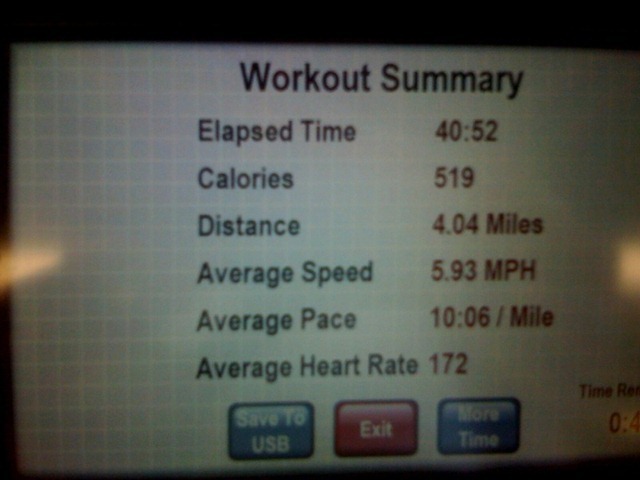 As per my taper plan, I ran four miles. I kept the pace intentionally slow (10:00/miles) so as not to hurt anything just in case. It wasn’t particularly easy, given my allergies—breathing was a little harder than normal—but the good news is that my legs felt great! No random shin/calf/knee/ankle pain. Hallelujah. Of course my feet blistered, though, despite coating them in antiperspirant pre-run. Shocker. I don’t even care at this point—in one week I’ll be fitted for my custom orthotics. If anyone knows how to run with blisters, it’s me, and a new solution is in sight. Anyway, it was a big relief to have a solid run under my belt. It wasn’t speedy or easy, but it was definitely a-ok. Phew. 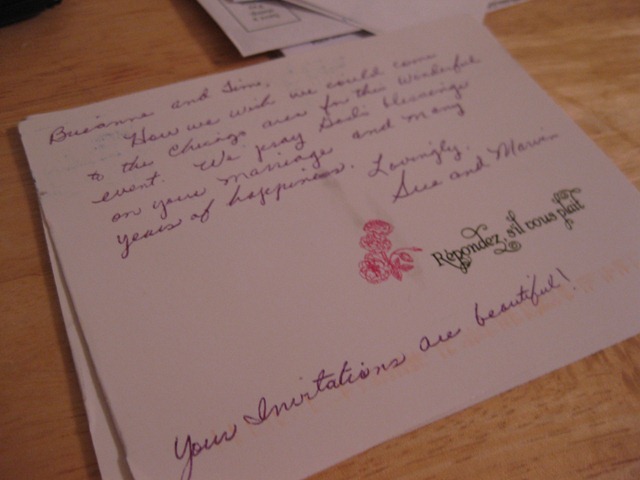 In other news, people are very excited to come to our wedding! Bringing the updated total to 63 yeses, 36 nos, 105 delinquent. 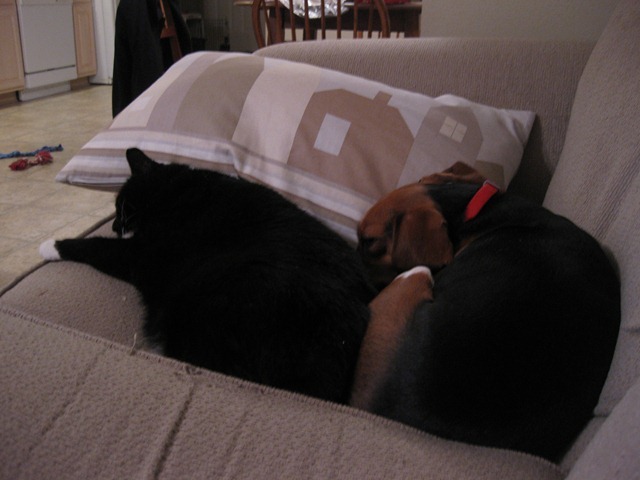 Oh, and here’s some further proof that Southpaw and Milhouse are lovers. 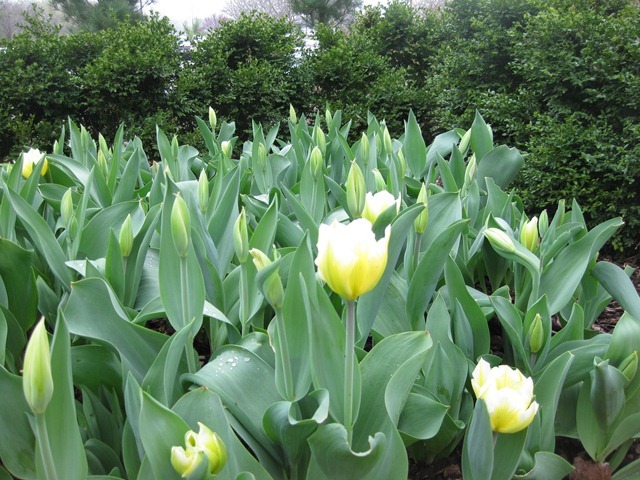 What’s your favorite thing about spring? I have to say, I love flip-flops and I don’t know what I’ll do now that I have a job where I can’t wear them to work every day! Okay. So, when do I get my life back? I have just been running and running and running lately, literally and figuratively! It’s tiring. Also, I forgot my camera today. Bad blogger. So you get iPhone photos today. I’m sorry. Morning snack. 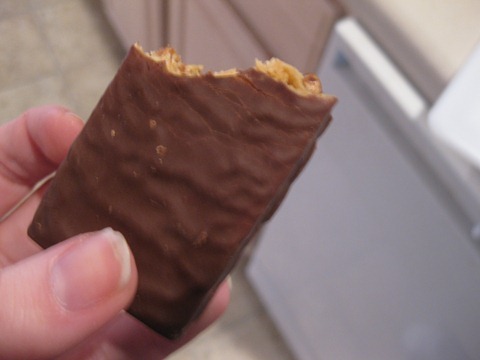 I really very much like these Kashi bars with the fruit sludge inside. They’re delicious. 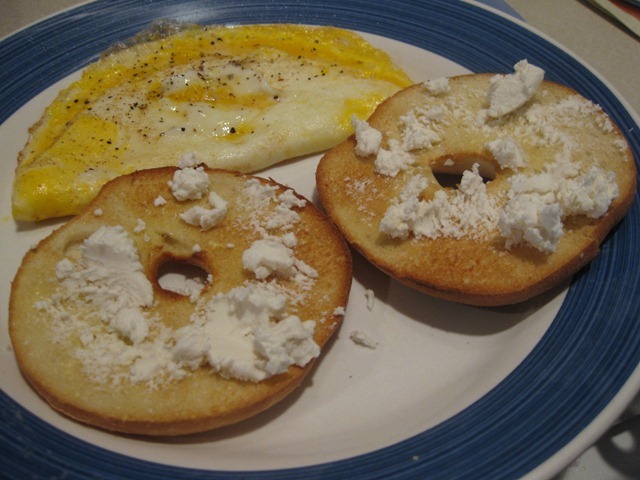 Lunch was some Annie’s Bernie-O’s, along with some Greek yogurt. I like to think they’re the more mature, health conscious version of Spaghetti-Os, but really, they’re shaped like bunnies. Anyway, they’re delicious and I am not ashamed. Candy season is almost over, folks. It goes from Halloween candy to Crimmus candy to Valentine’s candy to Easter candy, and then we are in a veritable candy famine until then. 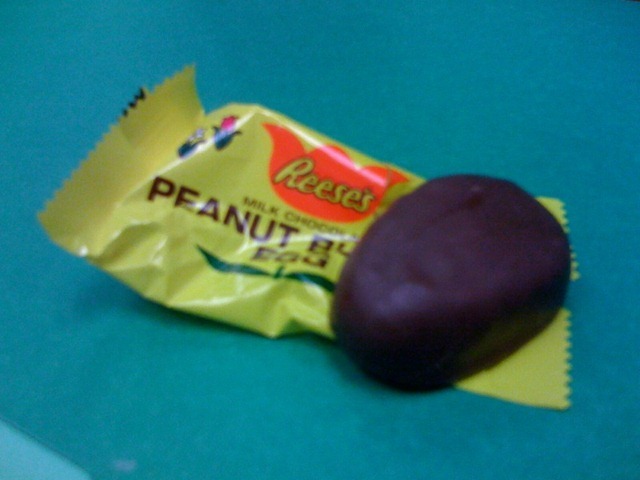 I had to get at least one Reese’s egg in under the wire. Running today? Technically, I was supposed to do 3 miles, but 3.1 is more fun because I can call it a 5K which sounds much longer. So a 5K it was. And I was determined to break 28:00. My BIG speed goal is to break 27:00 on a 5K, and not long ago this seemed completely impossible to me. But now it’s right around the corner! Total? 5K in 27:42. Boom goes the dynamite. Anyway, tonight is nuts. I have to pack, and I just realized I really have no casual shoes appropriate for my trip to Chicago, so I’m going to the shoe store with Tim in a bit. Why do I have to pack tonight, you ask? Oh, because tomorrow I have to run 11 miles after work…and my flight leaves at the asscrack of dawn on Friday morning. I seriously feel like I don’t remember which way is up anymore. Current RSVP count: 53 yes, 20 no. And someone bought our cookware off our registry! Woo! 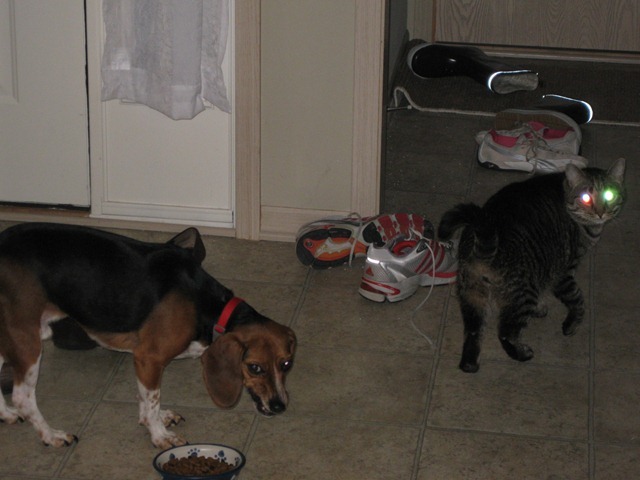 Finally, Tim caught Buckley in the act of dog food theft. (He has his high beams on.) Eating the dog’s food is his latest interest. Strange cat. Anyway. Shameless plug: check out me talking about how awesome I am over on Run, Eat, Repeat! Monica’s a rockstar and I have started listening to Pitbull when I run because of her. What’s your favorite candy-related holiday? I’ve gotta go Easter on this one, strictly because of Cadbury eggs. Hi, friends. It’s been a pretty uneventful day around these parts, which is a good thing. 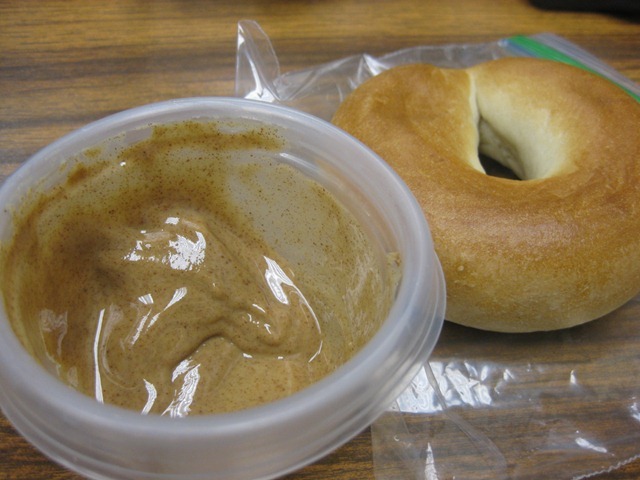 Lunch: a bagel thin sandwich, a nicely brown banana, and a Greek yogurt mess. I’m a tiny bit burned out on green monsters for the time being, and I have a bunch of Chobani in my fridge I’d hate to see go to waste. 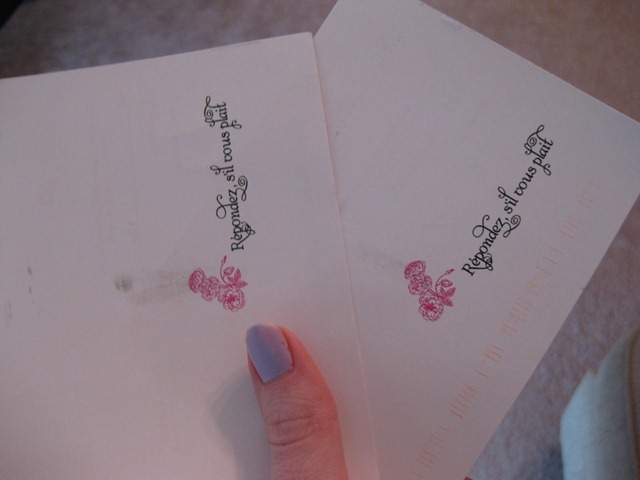 In other news…I have a bunch of tiny, annoying wedding crap to do before I head to Chicago (yay!) for my first shower and bachelorette party next weekend. It’s a lot of little things needling me, and it doesn’t help that I have to work from 6:30-1 on Saturday. The big thing? I have to get thank-you gifts for my shower hostesses (of which there are about a million) and wrap them. No idea what to get them. And I have to print out hair and makeup “inspiration pictures” to bring to my trial. Agggh. Hey, look! 2 RSVPs today. 2 people yes, 2 people no. This one REALLY hurts. I am a weensy bit concerned about infection with this one, as it’s very painful to the touch and red around the edges, so I’m going to keep an eye on it. 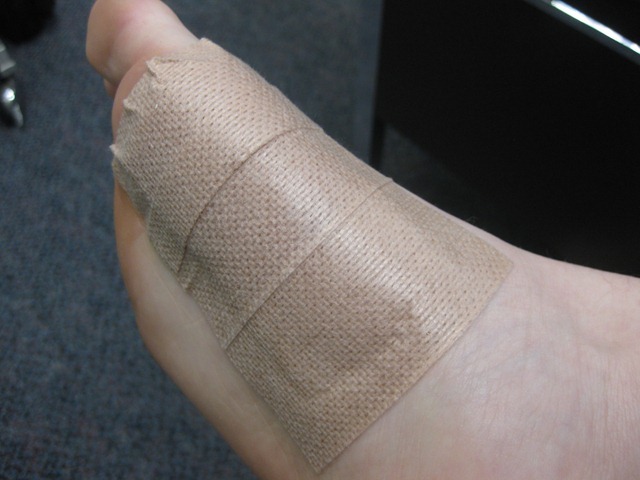 I was limping at work all day to the point where people asked me how I’d hurt myself. I decided to give it another day to rest and will attempt my 3 miler tomorrow instead. Normally, I’ll push through blisters, but this one obviously didn’t want any weight on it and I could feel myself rolling my ankle to avoid pressure in my work shoes all day. So, yeah. No good. I feel like my foot’s been gnawed on by a wild dog. 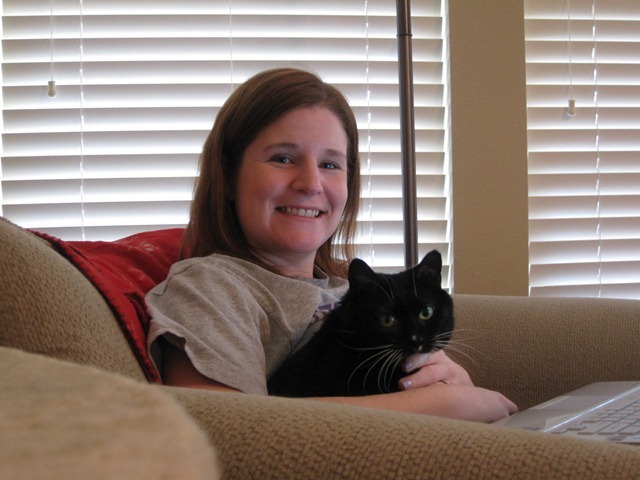 And for those of you who wonder how I blog…this is me, in my pajamas, with Southpaw and my laptop on my lap. She must like this post, because she is purring loudly on my belly right now. Anyone have a March Madness bracket going? I’m in Tim’s office pool and have Syracuse as my winner this year! Ahh, weekends. I was awakened around 8:30 by a wriggling beagle. Nothing like it! Tim and I ate a quick breakfast and headed downtown to get our passports at the ONE post office that takes passport applications on Saturday. While we were prepared with all our paperwork and such, there were several people in line who didn’t understand that you could fill out the paperwork first. My legs were sore from my run yesterday, and I was wearing my old Pumas+arch supports in the spirit of breaking them in. I was a crankysquatch, but we got it done. Yesterday’s long run made me a bottomless pit today. I just cannot get full! I’ve been getting down on myself a little, like “oh, 8 miles, that’s a SHORT run for a lot of people” buuut then I remember that my body isn’t used to such distances and calorie burns, and it’s all relative. Much better. I then spent a very productive Saturday afternoon napping from 12:30-2:30 with Buckley. Deeelightful. 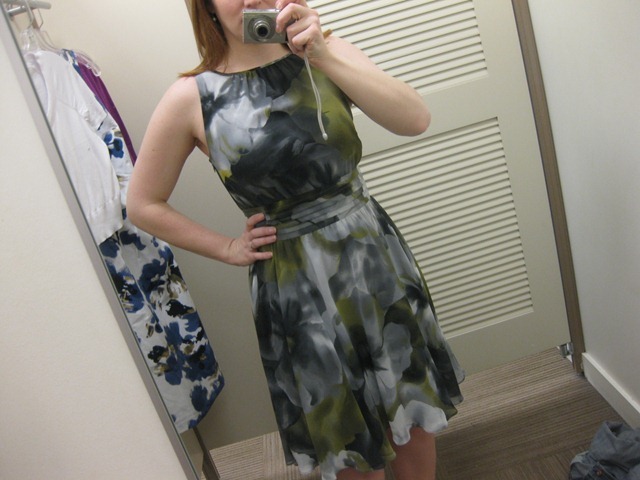 Anyway, I woke up and Tim and I hit the outlet mall for one last shower dress shopping try. I kinda liked this, but not as much as the stuff I’ve seen online. I’m going to order the blue and white strapless dress after I post this! I feel like it made me look a wee bit top-heavy. I did, however, score some nice workout gear at the Adidas outlet. I got a super-light wicking tank for $6.97 and a pair of navy wicking capris for $14.97. I’m officially going to get rid of the last of my cotton workout pants—now that I’m spoiled on wicking fabrics, I just can’t deal with sticky yucky sweaty cotton. Yeah, I need to clean my bathroom mirror. Cleaning is one of those things that’s slipped by the wayside as my running mileage has increased (along with shaving my legs, weight training, and making dinner). Whoops! 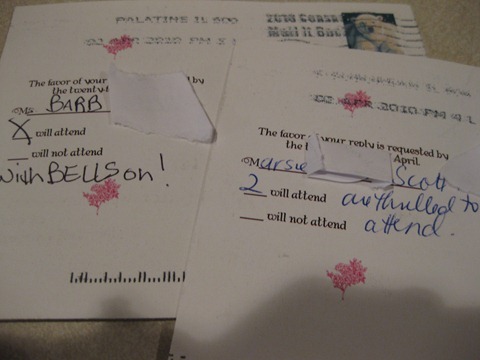 We also got a bunch of RSVPs today. The count now? Anyway, we went out to dinner and yes, I ate a giant cheeseburger and fries. 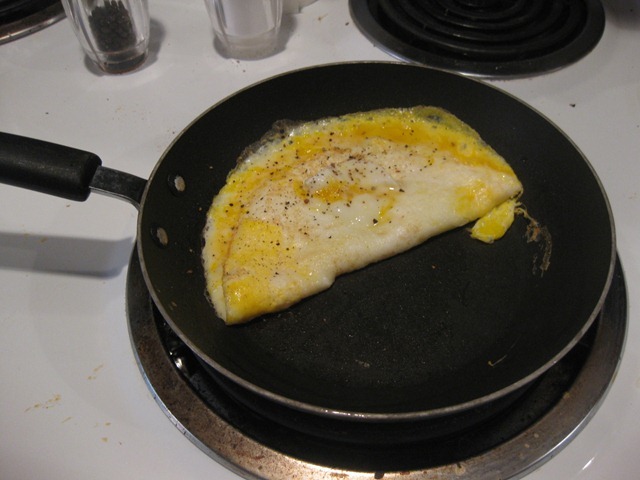 The bottomless pit demanded it (and, less than two hours later, I’m feeling rumbly again). Hopefully my appetite will be a little more subdued tomorrow! Have you ever seen a specialist for a sports injury? Did you have a good or bad experience? Today I was determined to have a fresh green monster at lunchtime, no matter how crazy I had to be to do it. 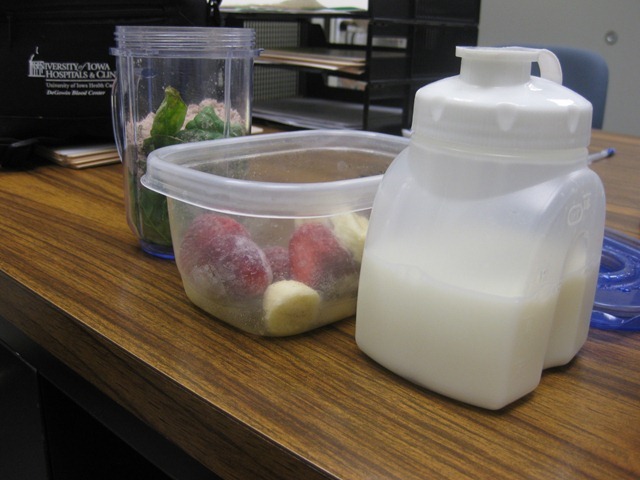 I packed the components separately—1 cup of milk, frozen strawberries and half a frozen sliced bananer, and a whole bunch of spinach and protein powder. 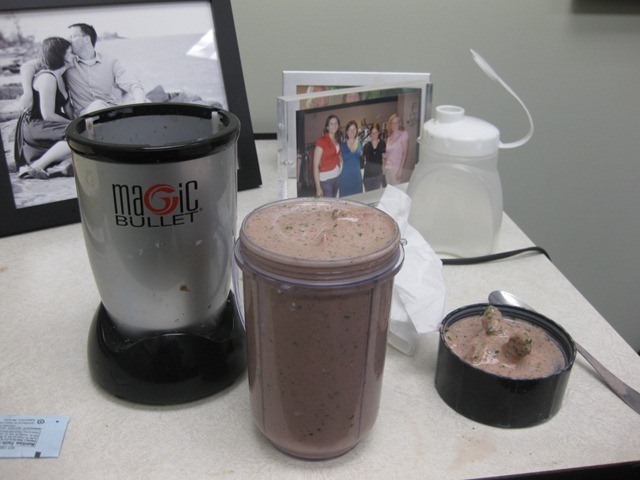 And yes, I brought my Magic Bullet to work today. It’s that fabulous. It was kind of messy. I went through lots of paper towels because I packed the cup too full. 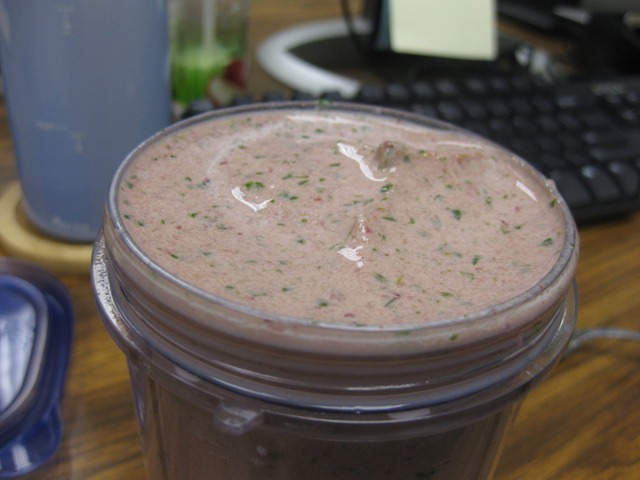 But in the end, I reaped a delicious reward—a strawberry choco-nana green monster. 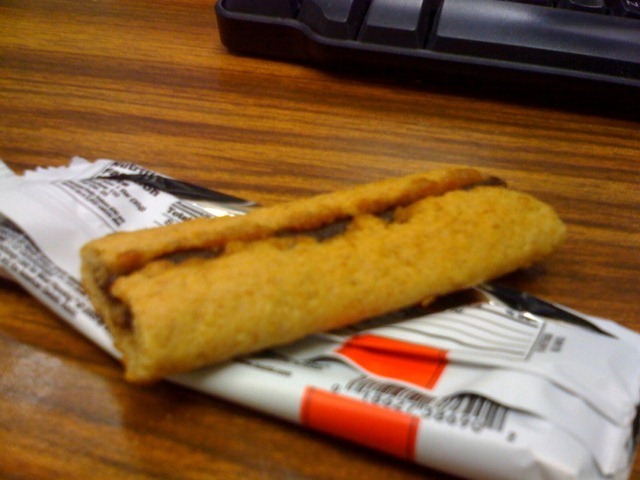 I swear these things keep me full for hours. 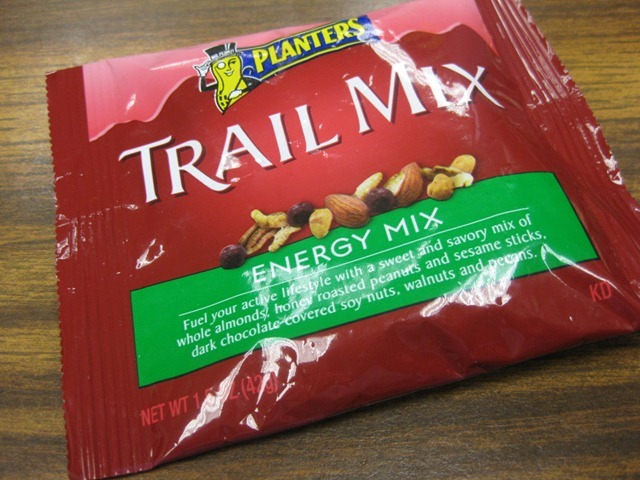 I also had this random trail mix left over from my Christmas stocking, and a turkey sammich on a bagel thin. My goal was to take in a lot of food pre-run today to avoid the voms afterward. 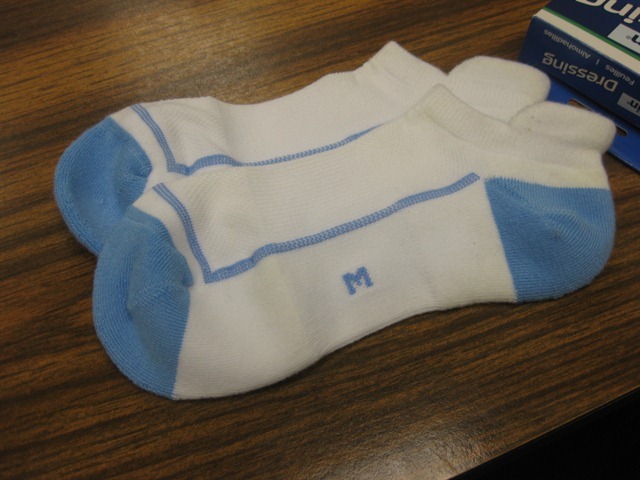 Look at my pretty new Feetures socks! These were my pity purchase at the running store yesterday. God love them. I also wrapped my feet with Second Skin pads and moleskin before my long run. The pads are funny—they’re kind of like jelly, and they are really ice cold when you stick them to your feet. Then you cover them with moleskin. I did this to the arches of both feet. 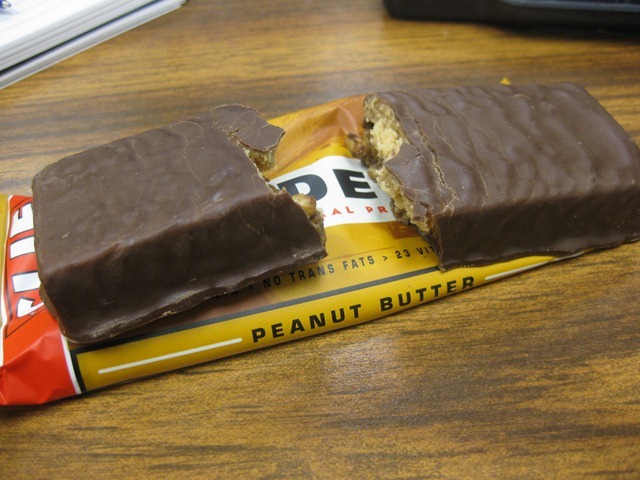 I wasn’t really hungry pre-workout, but ate half a Clif Builder’s Bar anyway. I was planning to eat the other half on my way home from the gym, but I wasn’t that hungry afterwards so I didn’t. Anyway, apparently my action plan paid off. The verdict? 8 miles in 1:19:30, shaving 1 minute off last week’s time. Woo! I knew it would be a good run when all the treadmills were open, so I could pick my favorite—the one where you can watch the news channel AND the sunset out the window with a fan directly aimed at you. Bliss. 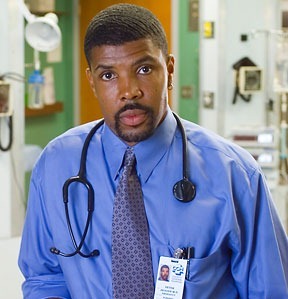 Dr. Benton, from old school ER, but in running clothes. He gets on the treadmill and runs 5 miles at a 6:00-6:30 pace…and then goes and lifts for about half an hour. When he finished his run I felt like I should congratulate him, but that would be awkward. Anyway. I find people who are truly athletic and in effortless good shape inspiring. Hats off to you, Super Fit Guy! In other news, Chocolate Outrage is indeed Outrageously Good. It does taste like frosting and will probably become my go-tu Gu. Yum! Anyhoo, my run was pretty uneventful, which is good. At about mile 5, the moleskin on my foot started (surprise surprise) rubbing and irritating my foot. So, now I’ve added chafing and a few more blisters to each foot. Ironic, huh—the anti-blister moleskin…gives me blisters. WTF. Oh, running. You hurt so good. When I got home, out of curiosity, I did the Runner’s World wet foot test (twice). I am having trouble interpreting the results, though. Help? In other news, more RSVPs today! 5 yeses, 2 nos. I love the notes people are writing on them! 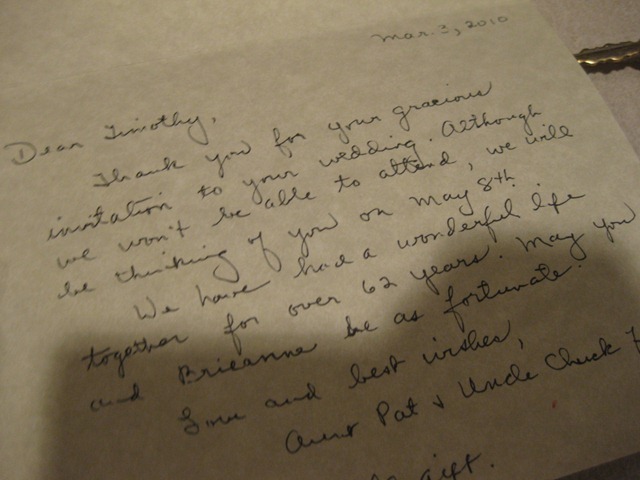 We also got a wedding card from Tim’s great-aunt and uncle. I love this sweet note. 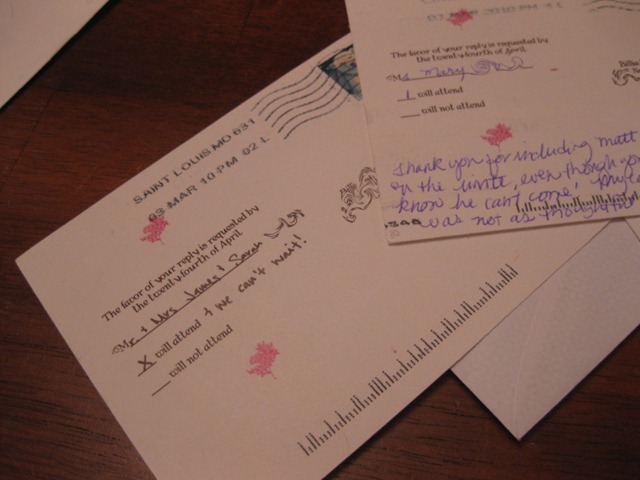 Getting RSVPs is really exciting, but I’m not going to lie—wedding stress has been starting to get to me. I feel like I’m being tugged in a million directions, and though I think people mean well, it’s incredibly stressful to try to please everyone (even though I know I won’t). Ultimately, I’m just trying to focus on Tim and drown out the noise, but it’s been hard. Please tell me it’s worth it! So, that’s that. I think Tim and I are off to Coldstone for a little post-run refueling. Have a great night! Last night I got busy creating my first green monster in awhile—chocolate cherry style, as is in vogue on the blogs lately. 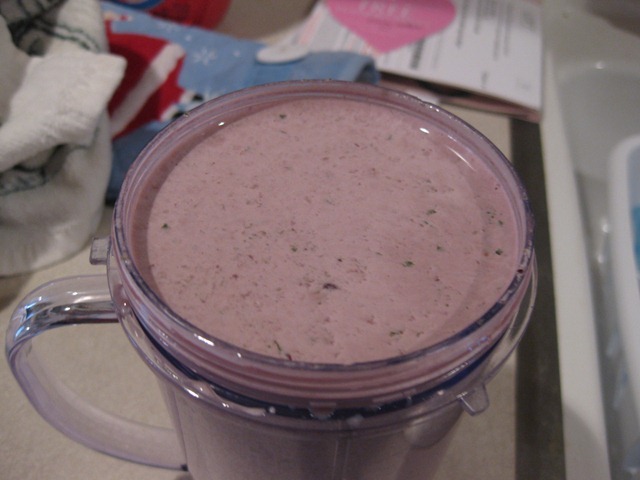 I love my Magic Bullet. Greatest infomercial product EVER. Look! 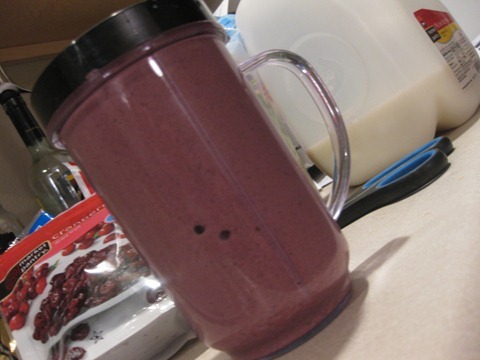 I made the smoothie IN THE SAME CUP I DRANK IT OUT OF. Minimal dishes, everyone! I stuck it in the freezer overnight and thawed it out in the fridge all morning. It did not go well. 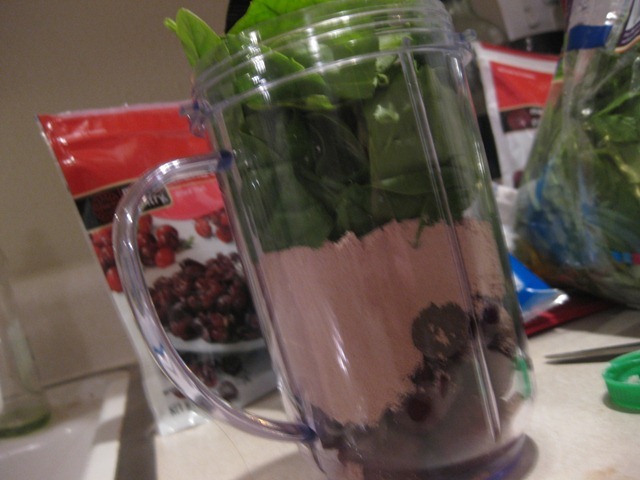 My beautiful, cherry red smoothie with flecks of brown and green turned into a muddy brown mess. 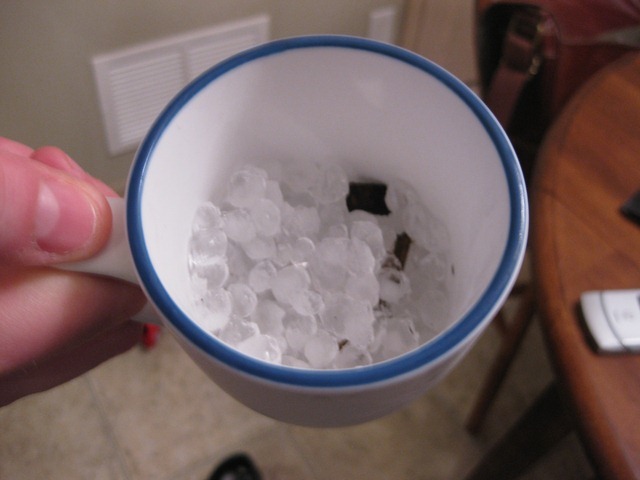 I ate it anyway, but I don’t think freezing/thawing was a good idea. 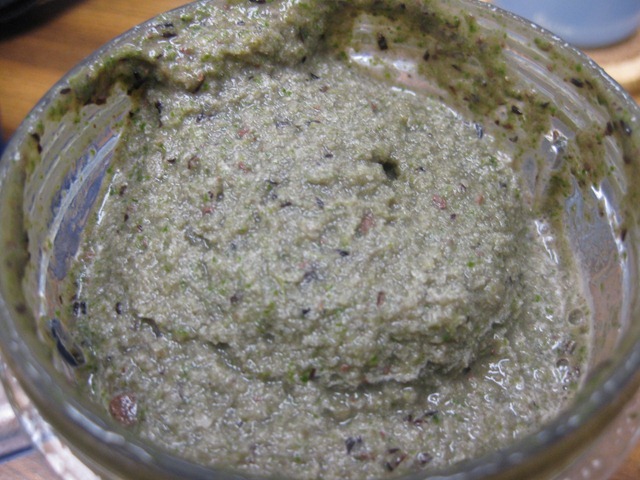 The spinach tasted off, like it had wilted, and the texture was slushy, not creamy. Bleh. Note to self: Green Monsters are best fresh. 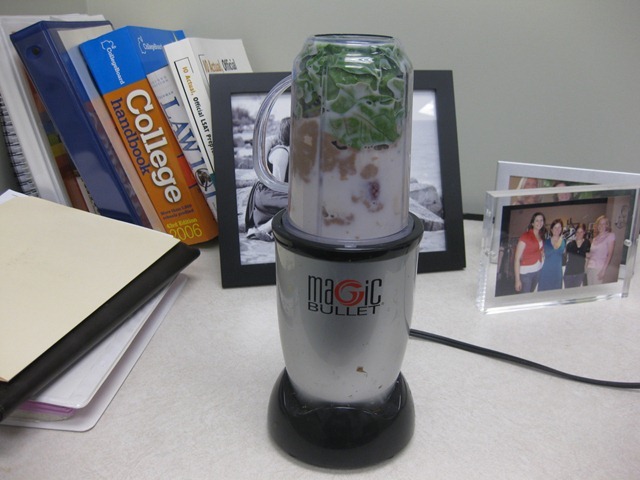 I am seriously considering bringing my Magic Bullet to work so I can pack the ingredients and mix one up in my office behind closed doors at lunchtime! I WILL say that it kept me quite full. 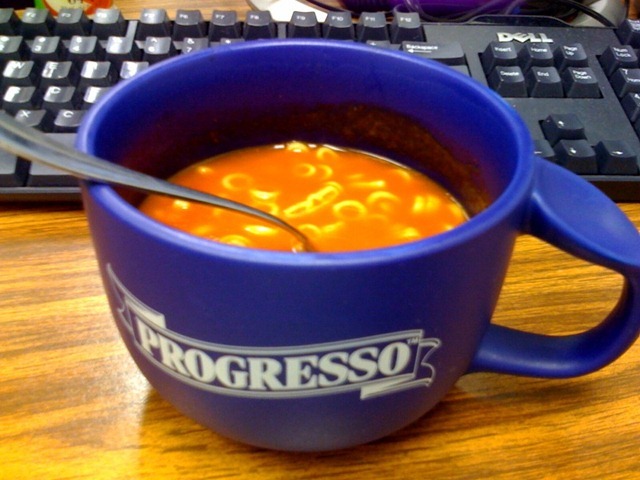 I had it with a cup of chicken noodle soup and a Western bagel with Trader Joe’s almond butter. After work, as usual, I went to run. As soon as I put my Brooks + arch supports on, I knew it was not going to be a good one. Every step was excruciating. The pain was mostly in my arches—an intense rubbing sensation that just felt like my feet were on fire. However, I also now have what feels like a huge knot on the inside of my right shin, kind of behind the bone on the side. Fabulous! Warning: gross foot pictures ahead. Just so you all know I’m not a big baby, here’s the current status of my footsies. Tim commented the other day that the blisters on my feet are like rings on a tree, and really, it’s true! That big red circle on my right foot is the remains of Blistersquatch, which I got in my Sauconys circa early January 2010. The tiny blood blister is from my New Balances. The crap in my left arch is a New Balance/Brooks hybrid. I can tell many a tale from my feet! Seriously, though, I’m frustrated. I literally limped off the treadmill and hated every searingly painful step of my run. Everything from my knees down hurt and seriously considered stopping pretty much every 3.2 seconds. But I didn’t, and ended up running 4.5 miles in about 44:30. 4.5 hard, painful, frustrating miles. I get that arch supports might take some breaking in, but this doesn’t feel like breaking in to me. This feels like, “WE WERE NOT MEANT TO BE ON YOUR FEET” pain. I hate to be a complainer, but I just don’t know what to do. A kind reader (Hi Sarah!) suggested via e-mail that I try custom orthotics, which is a good idea, though I am afraid of the cost. My buddies at the Sports Medicine Store actually make them, so it might be a good topic to broach with them eventually. I will probably go back this weekend and beg Bob and the trainers for more help. I just feel like I’ve done it all at this point: Nikes, Adidas, Asics, Sauconys, New Balances, Brooks, Body Glide, various synthetic socks, taping, liquid bandages, non-liquid bandages and a partridge in a pear tree. I’m frustrated, but I will not give up on this. I can’t. Anyway, in more interesting news, thank you all for your confessions this morning! It’s good to get it all out there sometimes. No wedding RSVP’s yet, but hopefully tomorrow! Any Green Monster fans out there? How do you make yours?